Many of us in the dental field have been using the word ‘analog’ improperly. We often refer to analog technologies as being anything preceding digital technology. That’s definitely not the case. So this post is to collectively save us all from ever sounding stupid to technology nerds ever again. And don’t worry, it’s not just us, I’ve seen the same mistake made in the New York Times. I recall a video that referred to 1950’s classrooms as ‘analog learning’ as opposed to our modern classrooms’ use of computers and the internet. I’ve heard the work of contemporary digital artists and designers compared to the ‘analog art’ of painters. The real kicker, and reason for this post, is those who position traditional handmade work as the ‘analog’ opposite of digital dental technology. Restorations that are handmade are not analog, period. 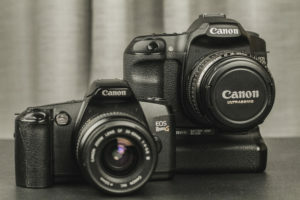 As an analogy, I recently picked up a used Canon Rebel G from the ’90s used to shoot film. I have had a digital SLR from Canon for years now, and they’re obviously extremely different. But we have to be careful not to confuse ‘old’ and ‘new’, with two very specific terms like analog and digital. The word digital, to most people, refers to a device that can capture, store, or display data in a binary fashion. Ones and zeros, on and off, digital is all about numbers. Digital shouldn’t be confused with binary, of course, as digital simply means concrete values. The root word is digits, after all. Any system that utilizes solid values (or digits) is digital, binary is simply the most common system. Digital cameras, and conversely digital 3d scanners capture light with a sensor, that light is converted into data (numbers), so the use of the word ‘digital’ for your cell phone camera, DSLR, or 3shape is accurate. Analog, however, is a very abused word. I would venture a guess that the significant amount of technicians have used the word ‘analog’ to refer to anything done traditionally. If the new, fancy robot 3D scanners are ‘digital’ then our aging techniques are ‘analog’, right? Not at all. Leaning back on the camera analogy: Older cameras capture light with film, which is basically plastic, gelatin, and silver halide. When you take a photo (perhaps of an aesthetic full mouth restoration), photons hit this material and produce a latent (invisible) image, that can later be brought into view by bathing the film in various chemicals. You could write hundreds of blog posts on film development alone, but the point is that film photography is a chemical process. Conversely, when you stack porcelain, or process a denture, the materials go through various chemical and physical changes. Digital 3D scanners and traditional techniques are quite different, but I’d rather hear the word ‘chemical’, ‘organic’, or ‘magic’ given to traditional techniques before ‘analog’. Wait, What is Analog Then? So a great example of an analog technology would be a vinyl record. 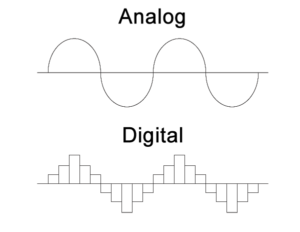 The audio is stored as waves (variable data) within the grooves of the vinyl. Digital audio stores the data as numbers, as finite units of data per second found in mp3s and CDs. What’s important is that a vinyl record is legitimately something that deserves to be called ‘analog’. Dentures are not. Dentures and the techniques used to fabricate them are physical and chemical, there is no data (waves or otherwise) to be found as there would be on the record. Plenty of older (and current) technologies are analog. Just be sure to ask yourself if that device has variable signals/data, or if that device is just really old. A television with a cathode ray tube (CRT) is an analog device; a cave painting of a man stabbing a mastodon with a spear is not. Ironically, CNC machines and 3D printers take digital signals and use transducers, pulse width modulation (PWM), or variable frquency drives (VFD) to produce analog signals that drive the spindles or lasers that ultimately produce a restoration. Those restorations are technically physical “analogs” of their corresponding digital designs. I know its hip to be anti-digital sometimes. But before we all drink a PBR and hop on our fixed gear bikes to the thrift store, we have to remember that just because something is old, that doesn’t make it ‘analog’. 35MM cameras, oscilloscopes, and the cotton gin are all old technologies, but only one of them is an analog device. I definitely cannot agree with this. When you pour gypsum model over impression it is for sure analogue. Particles of plaster are not equally the same size and they fill space in impression almost exactly as analog sound waveforms fills the silence. When you scan you sample the analog surface with finite amount of 3d pixels (voxels) which are the product of scan that builds up 3d model. On top of that model you print or crown you will is again sliced into finite amount of layers to mill or layer : hence digital way. Agreed, a gypsum model is indeed an analog of what is in a patient’s mouth. There are indeed steps and specific processes that can be referred to as analog. 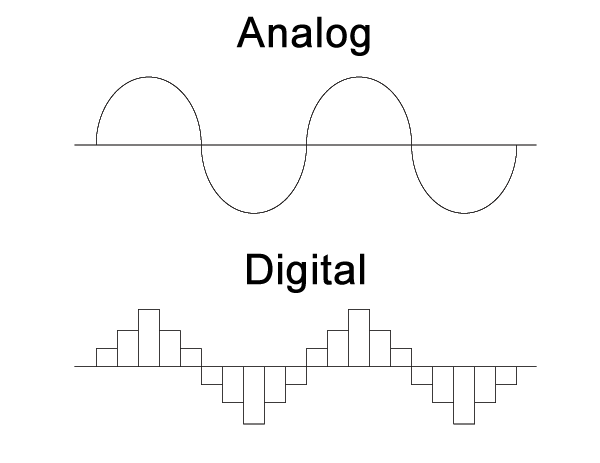 The point of this post is to convey the fact that not everything that is old or traditional can simply be referred to as analog and thought of as an exact opposite. Great point though, appreciate the comment!